Show me an example Maine Moose Tracks - Greenville Maine Moose Watching Tours: There's Moose Everywhere! Last night, August 12th we had two moose tours go out. With the past few days of rain it's been nice to have some sun again. The first tour was a private moose tour for a couple from Iowa. While on their private moose watching tour, the couple saw 6 moose; two on the pond, one in a stream, and three on the roadside! The couple also got to see loons and hares while on their safari. The other moose watching tour was for a group six made up of three couples all from New York. 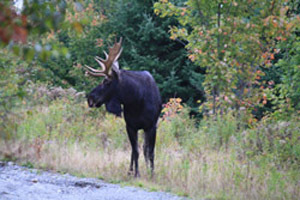 While on their tour, the couples only saw one moose out on the pond, but they saw other great wildlife Maine offers such as deer, loon and hares! The weather is warming up again, but there will be a few more showers in the week to come which moose love. It's the perfect time to see some moose!